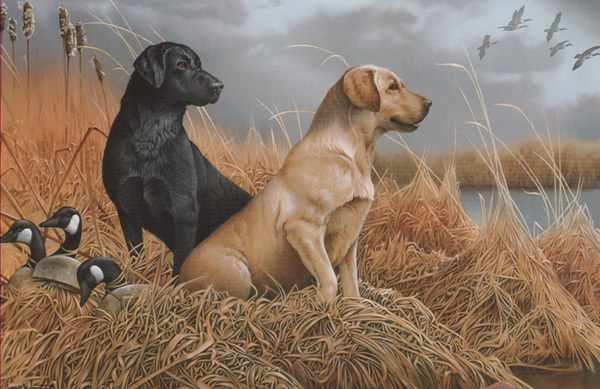 The Labrador hunting dog is without question, one of the most popular dogs in the world. Not only are they known as outstanding field dogs, they are smart, easily trained and double as most loved family pets. And, that's not all, they come in three popular colors, black, yellow and even chocolate. Here, Jerry has captured the Lab in their most classical pose, in the field in charge of the hunt. If you don't own a "Lab," you probably have a friend that does and would love this print. Jerry paints with a free-hand airbrush, even the finest detail is done without the aid of conventional brush.. Order yours today! Send koshgall@koshgall.com with questions or comments about this web site.